What are the best 6x8 car speakers? For me, it's quite clear that the JL Audio C5 are the undisputed champion for this size, but others may think otherwise. ​I've personally spent uncountable hours testing speakers, blown a few and thrown a few more to the trash out of pure frustration. I've created a list of my favorite 6x8 speakers which is a result of this massive study I did on the best car audio speakers earlier this year. High peak power handling means they can easily be integrated with an aftermarket head unit or standalone amplifier. In terms of pure power and audio quality, JL Audio is a very tough name to top in the car audio game. With 75 watts RMS, theses speakers get nice and loud without distorting or narrowing their range. If you want bass performance with clear mids and excellent treble range, these speakers have got you covered. They also have an adjustable 3-position switch for boosting your mid range so vocals and mid-range instrumentation don’t get lost in the bass and treble, but at the same time don’t sound of place or harsh against the other frequencies. These JL are my recommendation on 6x8 speakers with good bass. You are going to need a pretty powerful factory or aftermarket stereo to really get the most out of these speakers. They have excellent sensitivity in terms of volume versus wattage output, but with a 75 watt per channel draw they are going to be power hungry. Having an amp that can drive them properly may require you to upgrade your old factory stereo, too. Additionally, the crossover network for splitting frequencies into their respective ranges are external, so they will need to be mounted and wired separate between the amp and the speakers. If you are ready for some monstrously powerful sound, these are going to be the speakers you want to look at first. First of all, these speakers are loud even when you are running them on a lower wattage channel. This is largely due to the fact that their sensitivity﻿﻿ response is a whopping 94 dB, which is significantly higher than about 90% of the competition. Add to that an RMS power rating of 75 watts and a maximum capacity that peaks at 200 watts, and there is not a car audio setup on the market that would not benefit from a set of these V468s. They also feature integrated crossovers, which means less wiring and mounting work for first time DIY installers. So, bottom line: they’re loud, they have excellent frequency response range, and their black and red high contrast styling adds a nice aftermarket touch to any vehicle. All in all, these are the best sounding 6x8 car speakers available on the market on 2017. Again, as with most speakers in this particular size and class, these speakers will perform best with a more powerful aftermarket stereo driving them. The V468s perform better than most speakers of their type due to their excellent sensitivity rating, however, some listeners may find that their midrange and lows suffer a bit on factory head units. It may be worthwhile to consider upgrading your stereo in addition to these particular 6”x8”s. Beyond that, there really isn’t much to criticize about this particular speaker pair. Bassheads love Kicker’s speakers, and with good reason. In terms of overall bass performance, it’s hard to beat any pair of Kicker brand subwoofers or component speakers. True to form, the bass performance of these speakers really brings some thunder to your car audio, and they balance out nicely thanks to their 1” tweeter cones. They’ve got plenty of power handling whether you want to run your factory car stereo or an aftermarket amp. Even on low power, theses 40CSS684s can really crank out volume thanks to their exceptional 90dB sensitivity. These speakers really are an exceptional value, and if you want to upgrade your car’s audio for a minimal cost, Kicker is definitely the brand to buy. In my humble opinion, the best 6x8 component speakers you can get. There are a few things you should be aware of if you think this might be the speaker set for you. First, the tweeters and crossover networks are all external. That means separate wiring and mounting for both the tweeters and crossovers in addition to the big 6”x8” woofer cones. This means some tapping and drilling into the interior panels of your car in order to mount the tweeters (unless your car came with punch-out panels for high end audio), and you will be fishing wires under,over, and around your dash assembly. It’s not impossible, but if you don’t have a lot of DIY experience it could prove to be challenging to get everything setup correctly. Crossovers, tweeters, and woofer cones all must be wired and mounted separately. Some factory car stereos may not necessarily be optimal for driving these speakers in terms of watts per channel. Still designing some of the best sounding speakers available, Pioneer brings pristine audio fidelity with powerful performance to the car audio game. Their 6”x8”s deliver the cleanest overall sounding audio fidelity across the board without sacrificing power or punch. Take a look at why these are such a great value. 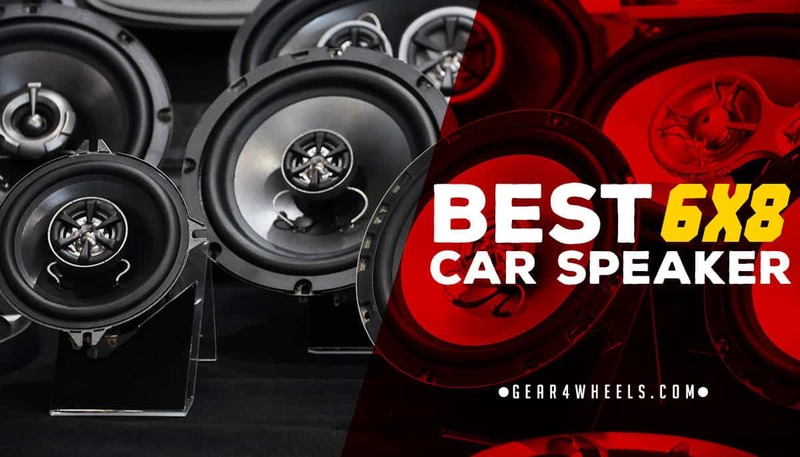 The best thing to love about these speakers is that they only draw 60 watts RMS, allowing most factory car stereos to take full advantage of what they have to offer. On the other hand, thanks to their 260 watt high peak performance, these 6”x8”s can also bring the noise with an aftermarket amp. All components are made of the highest quality materials, and they are extremely easy to install thanks to their integrated crossover circuits. The sensitivity rating is lower than comparable speakers, meaning that they aren’t quite as loud at low power compared to other 6”x8” component sets. That’s about the worst criticism I can level at these speakers though, they are an excellent sounding pair that really makes your car audio come to life. The TS Series from Pioneer is one of my favorites overall, and I also recommend the 6.5inch version of this same ﻿speaker ﻿as one of the best. Rockford Fosgate brings the noise with the best of them, except few can deliver the clarity and exceptional punchiness that has made them a household name in car audio circles. Check out these excellent 3-way 6”x8” speakers. Where to begin? There is a lot to love about these 3-ways. Their crystal clear highs, powerful midrange, and booming bass all make them some of the best sounding speakers in their class. Crossovers are integrated so they don’t require any additional mounting or wiring, and at 65 watts RMS they are compatible with most factory car stereos without sacrificing any of their clarity or power. If you want to upgrade the overall quality of sound in your vehicle, this speaker set is going to do the trick. The lower end of the frequency response for theses speakers is not quite as good as some comparable models. The 3-way coaxial design compensates for this by boosted midrange, but some listeners may hear a difference in the low end when comparing speakers. It’s a small criticism, but worth mentioning. Beyond this nitpicky problem, it’s an excellent speaker set. In this video you can see an overview of this series which is one of my go-to speakers when the available budget isn't a lot. Do these speakers fit my existing speaker enclosures for my car? Does your factory car stereo have enough power to drive your new speakers? Do you need to upgrade the stereo as well as the speakers? How difficult will it be to install your new speaker set? Are all installation materials included, or do I need to purchase some items separately? Going over these questions often helps to eliminate difficult choices between different speaker sets, and it gives you confidence in your decision since you know that you have considered all the options. Now for my recommendation. For my money, I’d definitely buy the CERWIN VEGA V468 6-Inch x 8-Inch 400 Watts Max/75 Watts RMS Power 6”x8”s. They offer the best overall performance and sensitivity, and they also won’t break the bank in terms of cost. The V468s also sound every bit as good as they look, with some serious bass kicking and flawless mid and treble range performance. They are also constructed of the toughest, highest quality materials, ensuring that your investment lasts for many years to come. If you are seeking to upgrade your car speakers to get that “In the studio” sound from all of your music, then these are the speakers for you. Hey alex great article, i’ve tried some speakers from your list,currently i have installed in my car The rockford Punch p1683 and it’s great. Hey, cheers buddy! P Punch series is great value for money. Happy you like them!